While the latest administration proposal adjusted the parking rates the adjustment was minor and would still, for some unit members, consume the entire negotiated pay raise. The FSU continues to insist any increase in rates must be reasonable and, at a minimum, be mitigated by any potential monies allocated to relieve UMB debt and/or parking and transportation costs. 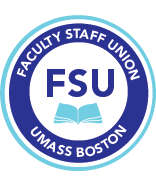 The FSU continues to fight for maintaining multi-parking passes for all unit members. We also insist the current hours of operation be maintained so that parking in the evenings and on Sundays is free. We advocate for handicapped parking spaces that are conveniently accessible to respective campus work locations and acknowledge temporary handicapped status. The FSU, in coordination with our union colleagues in CSU and PSU, made our voices heard at Convocation with a powerful demonstration of our collective concerns. Three FSU members gave powerful testimony to the Administration on the issues above and how the Administration’s proposal would negatively impact them as well as the life of the university. Their testimony was powerful. Please consider telling the Administration at one of our subsequent bargaining sessions how their proposed parking fee increases will impact you please! The testimonies are needed and persuasive. Our next bargaining sessions are on Sept 26, October 25, and possibly October 31. ►Please see FSU President Marlene Kim’s remarks at the Board of Trustees meeting in Lowell on our parking situation here and in the FSU blog. Please see FSU member Emilio Sauri’s response to previous blog posts on the parking proposal here .